You are so welcome! I’m so glad that you liked them and that the metric measurements were helpful! =) Thank you for commenting! These cookies were so easy to make! My toddler helped me and they turned out so thick and gooey and delicious! 5 star recipe all around for taste, texture, easy and speed! Love it!! Thank you so much! I’m glad that you enjoyed the cookies and that they were easy to make. =) Thanks for commenting! Do I use salted butter or unsalted butter? You can use either one! 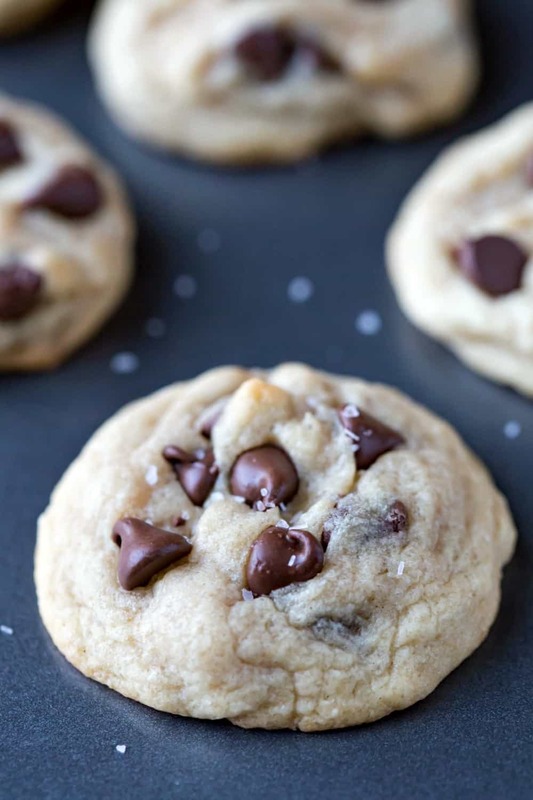 If you prefer less salt in your cookies, go with unsalted. If you like a bit more, go with salted butter. You’re welcome! I’m glad that you liked the cookies! =) Thanks for commenting! Girl! 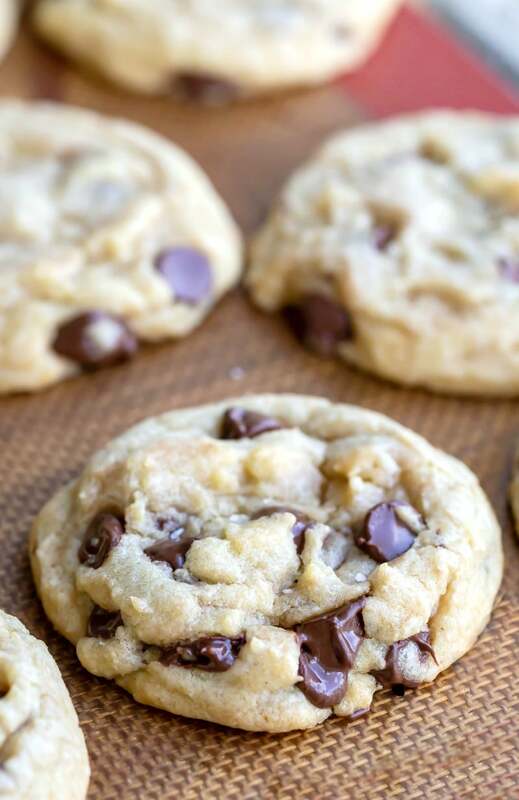 what an amazing quick and easy chocolate chip cookie recipe! love, love, love how they turned out! Thanks bunches! Thank you! I’m so glad that you loved the cookies! =) Thank you for taking the time to comment! I follwed the recipe to a T and the cookies were great. Thank you. Yay!! I’m so glad! Thanks for commenting! Love it!! Thank you so much! =D Thanks for commenting! 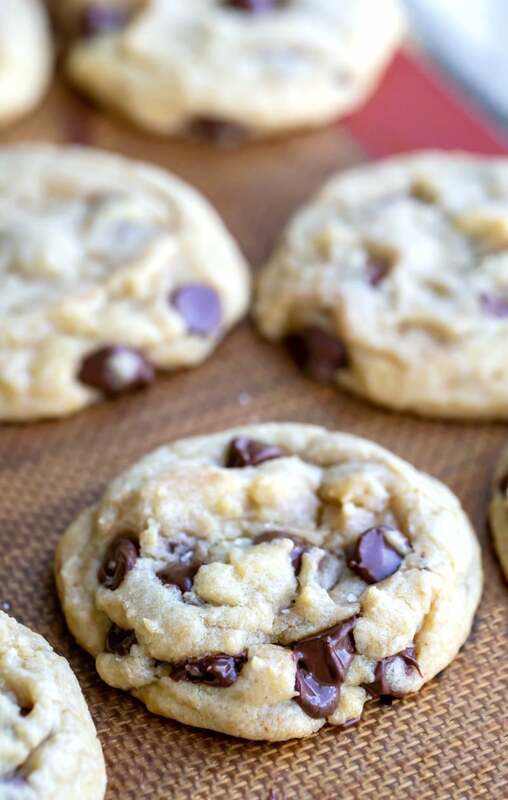 It’s usually a matter of too much flour in the dough if the cookies hold their shape as they bake. How are you measuring your flour? Love!!!!!! Taste so good, and the easiest recipe ever! Thank you! I’m so glad that you liked the cookies! =) Thank you for commenting! I made these for a Christmas party and everyone loved them. I am planning to make them for my sons Sesame Street birthday party next month. Do you think they would freeze well if I made them early? I’m so glad! =) I think so! I don’t see any reason why the cookies wouldn’t freeze well. Absolutely loved this recipe and cookje. Was truly the best and easiest. I will have to keep this one in stock!!! My husband loved it and it’s his go to treat. His backpacking staple from now on. Thanks a million. The dough got a bit soft and sticky, so I chucked it in the fridge… it needed to come back up to room temp the next morning for me to work with it… flattened between parchment and then chilled seems easier. I’m glad that you found a way to make it work for you! =) Thank you for sharing! WOW. Had a craving for cookies, but did not want to invest the time just then. This was a great and easy solution! Thank you! Sounds like this recipe was just what you were looking for. Glad you liked the cookies! =) Thanks for commenting! Thank you! I’m so glad that you liked it and found it simple to make. =) Thanks for taking the time to comment! These cookies are so good! 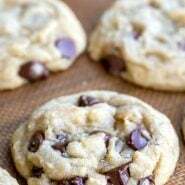 Thank you for this recipe, I’ve been trying to find a perfect chocolate chip cookie recipe and tried plenty and have been very disappointed but this easy recipe was fast and the cookies are soft, chewy, and perfect! I can’t wait to try your other recipes! 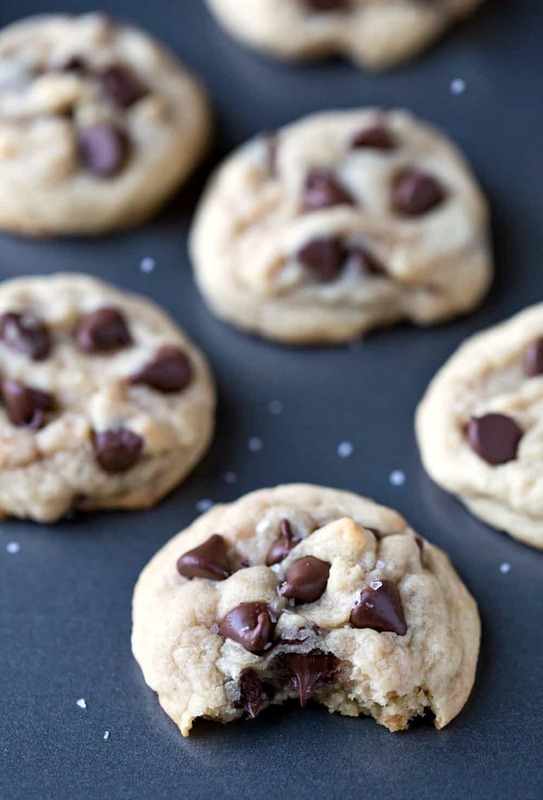 Wonderful cookie recipe! It’s so easy and the cookies are soft just the way we like them. Taste absolutely great but the cookies came out pretty much exactly the same size as they went in? So I flattened them with a spatula as soon as I took them out, but still ended up with pretty tiny cookies! What did I do wrong? Hi! You shouldn’t need to flatten them. The dough should be soft and a little sticky. It sounds like too much flour in the dough, and that will prevent the cookies from spreading properly. How are you measuring your flour? Really appreciate the nutritional information! Not many sites have this! You’re welcome! =) I’m so glad that that’s helpful. Must have done something wrong as the dough did not seem “wet” enough and did not stick well?? Used my hands to blend? If the dough was dry, it was probably that you used too much flour in the dough. How do you measure your flour?